Fortunately, the talks on day 3 of TED 2017 were a little less thought provoking than the previous days. That gave my poor brain a little time to rest. Despite that, however, there were plenty of good talks worth thinking about. 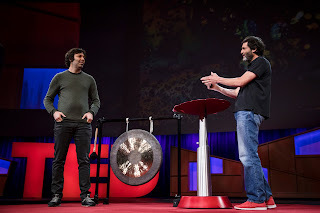 The first session of the day began with Dan Ariely and Mariano Sigman. Ariely is one of my favorite authors from whose books, especially Predictably Irrational, I often quote. They did an experiment with the audience. Each of us had to rate whether we agreed (and how strongly) with the outcome of a moral dilemma. For example, would we approve or disapprove of a company that created a million embryos and selected the "best" one for a couple based on characteristics the couple desired? We then discussed our answers in small groups of two or three people to see if we could come to a consensus. The resulting discussions in a room of 1,000 people were predictably chaotic, but quite interesting. In their few remaining minutes, Ariely and Sigman spoke about how their experiments have shown that such discussions can lead to more accurate conclusions and how that might prove useful in our polarized society. Robin Hanson spoke on what porting our brains to computers might mean. Anika Paulson is a 19-year-old student who gave a charming talk on the importance of music in her life. Anil Seth described science's attempt to understand and quantify consciousness. The second session was dedicated to the topic of climate change. The speakers were generally good, but only a couple of the talks were really thought provoking. Among the many talks, Kate Marvel spoke on clouds and their varied impact on the climate (high-atmosphere clouds add to global warming while low-lying clouds contribute to global cooling). Kristin Poinar told about her field of glaciology and how we are beginning to understand more about the ice sheets in Greenland. (She gave a homework assignment I need to try. She said that ice does not melt in a microwave as the waves just pass through it.) Tim Kruger told about how his company is developing natural gas-driven fuel cells that will be not just carbon neutral, but carbon negative. Daan Roosegaarde described his environmental art projects that include air scrubbers for parks that produce carbon that they then turn into diamond rings. Retired Rear Admiral David Titley related how he literally lost his house in Katrina. He never found out where it washed away to. He spoke about how the US military sees climate change as a destabilizing force around the world and used Syria as an illustration. Danny Hillis called for research to better understand solar geo-engineering. As an example, he told about the possibility of using chalk in the stratosphere to slow or reverse global warming. Suffice to say, many of the other speakers disagreed. The highlight of the session was Ted Halstead. 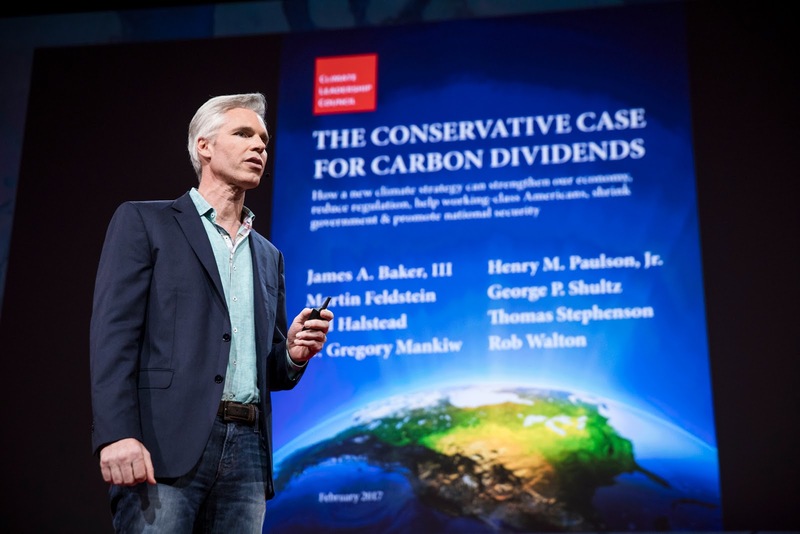 He presented a Conservative solution to climate change. The plan consists of a gradually rising carbon tax, giving all that money back to Americans via carbon dividends (a net win for the most people, especially for the lowest earning ones), regulatory rollback of no longer necessary laws, and a border carbon adjustment (basically a tax on goods from countries without carbon taxes to level the playing field). The session's MC, Chris Anderson, mentioned he never before had seen a standing ovation for a Conservative. I would really like to see such a plan implemented. What TED session on climate change would be complete without at least a cameo by Al Gore? So, Chris Anderson had Gore come on stage and answer a few questions. Despite the political changes in America in the last year, he was still optimistic that we are in the early years of what he called a sustainability revolution. He also believes that the President Trump probably will not back out of the Paris Accord. The third session of the day included two compelling and moving talks. David Miliband was born to two World War II immigrant parents in UK. He described refugees as not being people pursuing better lives, but people fleeing for their lives. He cited statistics such as 25% of the people in Lebanon being refugees (mostly from Syria), half of school age refugees are not in school, and that the US currently takes in only 0.1% of the world's refugees. He told of many refugees who were born in refugee camps and fear they will never leave. He sees the biggest question of 21st Century is how we will treat refugees. He did not claim there are any easy answers, but believes that the problem is one we have the resources to tackle, but only if we have the will. I certainly hope we (Americans and others around the world) will. an Arab, Muslim, and gay refugee. Luma Mufleh is a refugee, Muslim, Arab, gay, and is currently a US citizen. (She quipped that those characteristics are not exactly popular these days!) She told of her isolation in the US and how a North Carolina Southern Baptist woman befriended her. She then related about her experiences as a soccer coach to Arab refugees in Atlanta. They are scared. It broke my heart to hear how they have been treated by Americans. I came away again wondering how I might as a Christian do what the NC woman had done and help Muslims in the US. 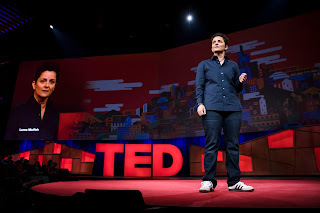 Mufleh received the biggest and longest standing ovation so far of this year's TED. Cathy O'Neil discussed the problems of machine learning algorithms being secret. She pointed out that algorithms don't necessarily make things fair. She told of algorithmic teacher evaluations in places like NYC being secret, but causing dismissals. She called such systems as "weapons of math destruction" and called for legislation to require algorithmic audits. I'm less sure that legislation is the answer, but she is totally correct that we have a real problem in this area. Other talks in the session included Anna Heringer on sustainable builds out of mud. Grace Kim spoke on co-housing (buildings and communities purpose built for people to eat and share lives together) as a way to address isolation in 21st Century society. Devita Davison gave an impassioned talk about urban farming in Detroit. The day ended with Jeffersonian dinners at different locations in the city. The way a Jeffersonian dinner works is that a group of people gather and discuss a topic. The conversation can go wherever it might, but everyone is involved in it. Rather than the typical meal where you only talk to the people next to you, everyone is involved. The topic of the dinner Mark and I attended was "Are businesses able to unite us where government fails?" I was rather skeptical how this would work, but we had an excellent conversation with our group of nine people. It was exciting to learn about what the other people were doing. For example, the person next to me owned a hotel chain that employees over 2,000 people and was actively involved in the schools in local communities and seeking to pay living wages. As is sometimes the case at TED, the attendees speak more eloquently than the speakers!